Crate Club Europe Pre-Order is now open to the first 500 members! Pre-Order today to receive a founding member challenge coin and lock in a discounted price for life! Curated tactical oriented items delivered to your door monthly. First Crate ships June 2017. First renewal in September 2017. The Premium crate is the holy grail of gear subscriptions, with an emphasis on hard to get, exclusive gear. some things we've included in the past were a trauma bag put together by benghazi attack hero, kris paronto, as well as a custom knife, hand made by former navy seal shane hiatt. Copyright © 2017 Hurricane Group, Inc. New York, NY, USA. All Rights Reserved. Become a founding member by pre-ordering above and gain access to gear offerings curated by Special Operations Veterans. We start shipping crates in June of this year. Your subscription will start in June and you will start receiving crates every month! As a member you are eligible for our annual club gathering and party. "The SOFREP Crate Club has got some some great gear picked by some great guys. Pick one up and you're not going to be disappointed!!" Marine Corps, 2/8 WPNS Co.
You First Crate Delivered in June. Auto renews each month, starting in July. Cancel renewal anytime. Auto renews every 6 months, first renewal in December. Cancel renewal anytime. Auto renews every 12 months, first renewal June 2018. Cancel renewal anytime. Sneak Peeks & Intel from our Veteran Staff. You will get curated tactical oriented items delivered to your door every month for [prepaid_length] months at a discounted rate starting June, 2017. Every item is hand-picked, tested and approved by the former US Special Operations team at SOFREP. Your first crate will be shipped in June, and your first renewal on July 1st, 2017.Your first crate will be shipped in June, and your first renewal on December 1st, 2017.Your first crate will be shipped in June, and your first renewal on June 1st, 2018. You will get curated tactical oriented items delivered to your door monthly, starting in June, 2017. Every item is hand-picked, tested and approved by the former US Special Operations team at SOFREP. Your first crate will be shipped in June, and first renewal on July 1st, 2017. Want a bonus item dropped into your crate? You can plus up your crate with an extra piece of gear for just an additional [extra_addon] per month. First Crate Delivered June 2017. Auto renews every 3 months. First renewal in September 2017. The NEW Pro Crate is a generous upgrade from our Mini Crate. 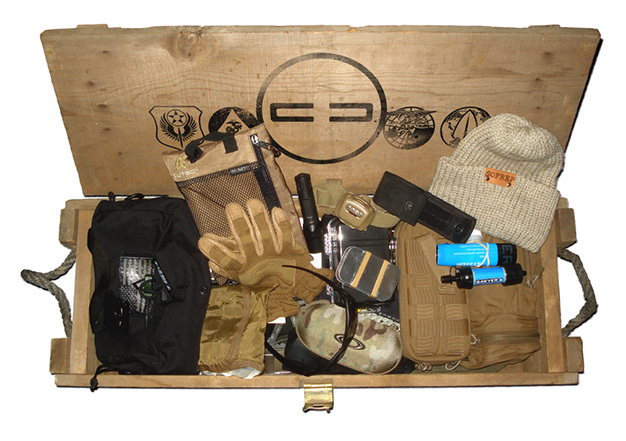 We've developed this Crate for those that are serious about being prepared. This Crate includes the months Mini Crate items, plus unique Pro Crate Items, making this a great step up! MAKE EVERY MONTH A TACTICAL CHRISTMAS! You will get pro level tactical oriented items delivered to your door monthly, starting in June, 2017. Every item is hand-picked, tested and approved by the former US Special Operations team at SOFREP. Your first crate will be shipped in June, and your first renewal on July 1st, 2017.Your first crate will be shipped in June, and your first renewal on December 1st, 2017.Your first crate will be shipped in June, and your first renewal on June 1st, 2018. Lock in your discounted Crate Club subscription for life by Pre-Ordering below. First Crate shipped in June, 2017 and prices will increase! All pre-orders include a challenge coin and a grandfathered price discount for life of membership.